Speak to Arianwyn in Lletya and tell him what the Mourners are trying to do. He will tell you that you must stop them reaching the Temple of Light. Head to the Mourner HQ and speak to the Head Mourner. You must be wearing only your Mourners Outfit from Mourning's End Part 1. If you don't have it then you can get another set by killing another level 11 Mourner on the Elven Overpass. 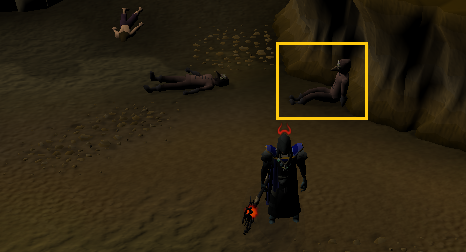 If you take any of the Mourner Equipment off or wield anything else in the area of the Dungeon that you can access without a Key, you will be attacked by a level 108 Mourner. The Head Mourner will tell you that a digging team has gone missing and will give you a New Key to unlock the locked door. Go through the door and head towards the West end of the Dungeon. 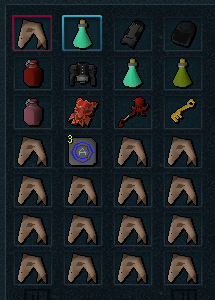 Head past the level 150 Dark Beasts (which are not aggressive). When you get towards the end of the Dungeon you will see a cut-scene. The are Mourners lying around dead on the floor. 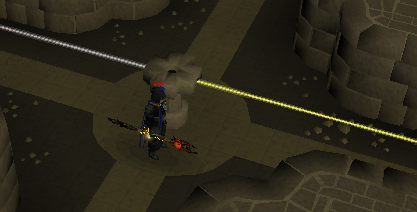 There are two Shadows that may attack you here so head back to a safer spot or teleport out as quickly as you can. Head back to Arianwyn and tell him what you saw. He will tell you that you must restore a protection mechanism to stop the Mourners reaching the Temple. He also wants you to get him a sample of the protection crystal because she says it will be darkened. 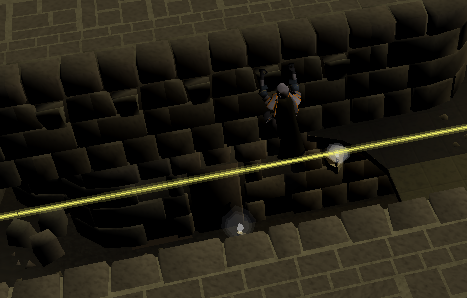 Withdraw a Chisel from your Bank and head back to the dead Mourners and search the first one you get to leaning against the North wall of the tunnel. You will get his Journal and a Colorwheel. If you wish, you can read the journal for information on him and the Temple before you enter. There are several things that you can do to make your stay in the Temple shorter and less painful. Put on Protect from Melee to limit the amount of damage the Shadows hit on you. They have fairly low Defence but very high Attack and Strength levels. There are two places in the Temple that you are safe from Shadows. These are down the stairs accessible from the center of the Top Floor and over the Low Wall in the Southern half of the Middle Floor. To get to the North half of the Top Floor go down and up the stairs situated in the center of the floor. To get to Top Floor climb up the Stairs near the South of the Middle Floor. Not the Ladder. To get to the very North part of the Top Floor you must climb the ladder at the North of the Middle floor. You can fall when trying to climb up or down any of the Ladders and get hit 50 or 60 Life Points. There are Traps hidden in the walls that will appear when you walk directly past them. If you don't manage to jump over them you will get hit 50 Life Points. When trying to cross the gap in the South-East corner of the Middle Floor you will fall quite a bit. It isn't just you having bad luck, it happens to everybody. Just take a sip of Agility Potion and try again. Have Auto-retaliate on at all times so you can easily kill any Shadows that attack you. Don't let your Prayer Points drop below 10. Head into the Temple and climb up the stairs directly in front of you. Go South and climb the stairs to the West of the path. 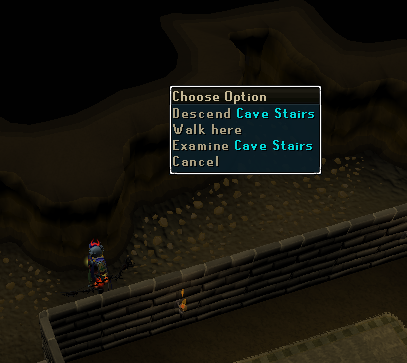 Just North of these stairs is a trap so step across to the other side and walk past. Go down the stairs to the North and up the ones directly ahead. Go East and then South into a large room. The Crystal will be in here. 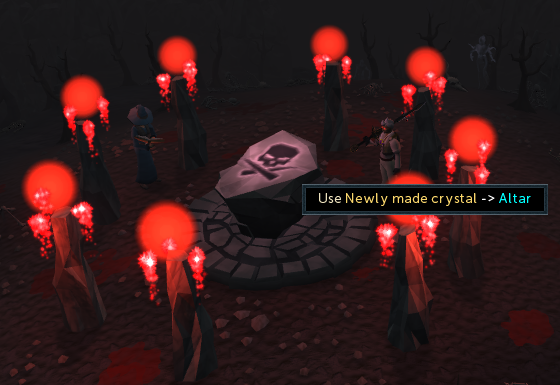 Use your Chisel with this Crystal to obtain a sample and take it back to Arianwyn. Talk to him and he will summon Eluned to enchant it. Use the Crystal on her and then talk to her. She will give you a Newly Made Crystal . Return to the Temple with equipment for a relatively long stay. 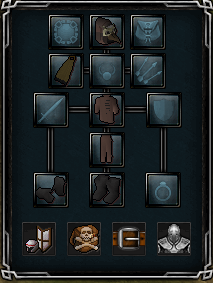 If you want to have to Bank no more than once while sorting out the doors then it is recommended you bring equipment that looks something like this. You will also at some point in this quest need a rope. However you are not likely to get to that point on your first trip. Head up the stairs near the entrance to get to the Middle Floor. On the East wall is a lever that you must pull and then click on again to collect the things inside. It looks like a door on the mini-map. 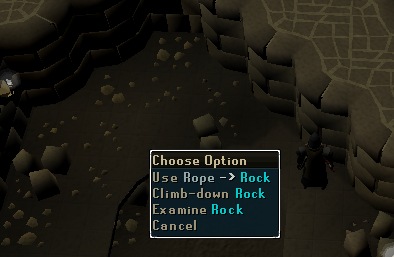 To pull the lever you should right-click otherwise it will be extremely hard to actually select it. There is a pillar beside the lever that you must use a Mirror with. The beam of light will be pointing South so you should click on the Pillar and chose to rotate the Mirror. Something will come up in the top-right corner of the screen that will let you rotate it. The top of the Mirror is longer than the bottom of it. 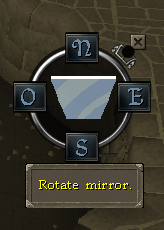 Click the button that says "Rotate mirror" until the beam of light is heading North. Head to the next Pillar to the North and insert another Mirror, this time making the beam of light head West. At the next Pillar insert a Mirror and make the light go South. 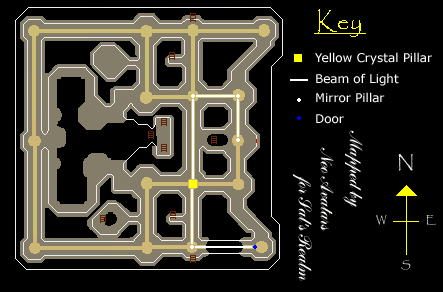 Head South and instead of inserting a Mirror into the Pillar you should put the Yellow Crystal in. This will make the beam of light turn Yellow. You will now have one Mirror left. Head South and there will be a ladder. North of the ladder is a Pillar that you must insert your final Mirror into. Rotate the Mirror so the light goes East and then try to cross the Hand holds. Go through the door and open the Chest. Head back to the lever and pull it to reset the puzzle. Collect all the Mirrors and Crystals from the tray and place a Mirror in the Pillar just to the West of you. Rotate the mirror so the light heads north. At the next pillar, insert a mirror and have the light head west. Then, put the Cyan Crystal into the next pillar. At the next pillar to the west, insert a mirror and direct the light to the north, then put a mirror into the next pillar and make it go east. 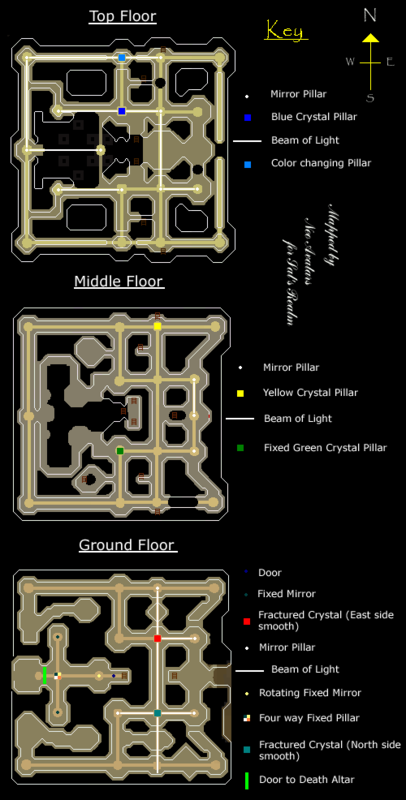 Put the yellow crystal into the next pillar east to get a green beam of light, and enter the magenta door. Search the chest and you will receive two mirrors. Head back to the lever and Pull it to reset the puzzle. Collect all the Mirrors and Crystals from the tray and place a Mirror in the Pillar just to the West of you. 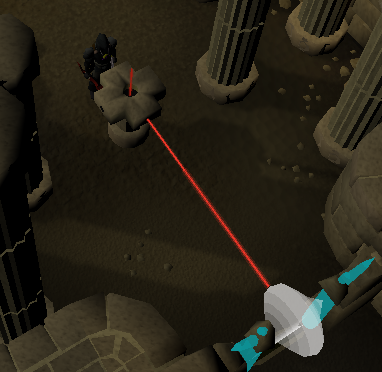 Make the light head North, West and then insert the Cyan Crystal in the next pillar you get to. At the corner make the light head North and then East again. At the next Pillar the light needs to head up. You can see that the light is going up because a beam of light comes out of the top of the Pillar. Head up the ladder that you are standing beside and insert a Mirror into the Pillar to the South of you. Make the light get deflected to the West. You will see that the light changes color as it goes through the wall. Head back down the ladder and go South to the Ladder beside the hand-holds. Climb up it and head to the stairs in the center of this floor. Go down them and up the ones directly in front of you. Head West and through a part of the Temple that is only 1 square wide. There are several traps that you will come across trying to go through this narrow passage. Once you are through head North to the Pillar. This is where is gets complicated. You need to insert a Mirror and make the light head down. To do this make the top be facing East and the bottom facing West. There will be no visible light coming out. Head back down to the Ground Floor and go to the North-West corner. Go through the door and rotate the Mirror already fused into the Pillar so that it is hitting the other door (to the South). Head through this door and follow the passage to the East. At the end of this passage will be a Chest that you must search. Head back through the door and rotate the Mirror so that the light is heading East and you can exit. 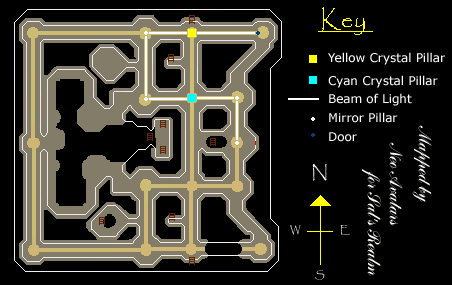 Don't pull the lever, but head back to where you put the Cyan Crystal in for Door 3, remove it and replace it with a Yellow Crystal. Head back to where you made the light head down and change it so that the beam is heading South. From here head South to the second Pillar you come to and insert a Mirror. Rotate it so the top is facing North and the bottom facing South. Go down the stairs to the Middle Floor. In the bottom-left quarter of this floor is a room that you are safe from Shadows in. Climb over the Low Wall to enter then use a Rope with the Rocks on the West side of the hole. This Rope will stay here for future use. Climb down the Rope and head West. Go through the Door and search the Chest. Head up to the Top Floor, cross the stairs in the middle of the floor and put a Mirror in the Pillar just North-East of the stairs. Make the light go South through several walls. Cross the stairs again, and find the pillar directly south of the wall. 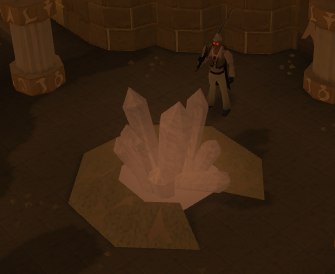 Use the Fractured Crystal with this Pillar. Light will reflect off it in all 4 compass directions. Head west from the fractured crystal pillar. 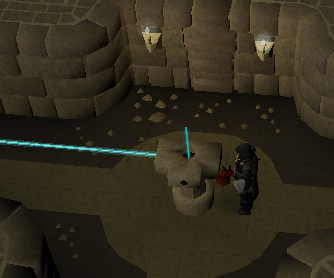 Put a mirror into this pillar and make the light head down. The top of the Mirror should be to the East and the bottom to the West. Go back to the Fractured Crystal and go South. Place a mirror in the pillar near the ladder, and make the light head east. Go east until you reach the end of this new beam. Put a mirror in the pillar you have reached and make the light go down by having the top of the mirror west. 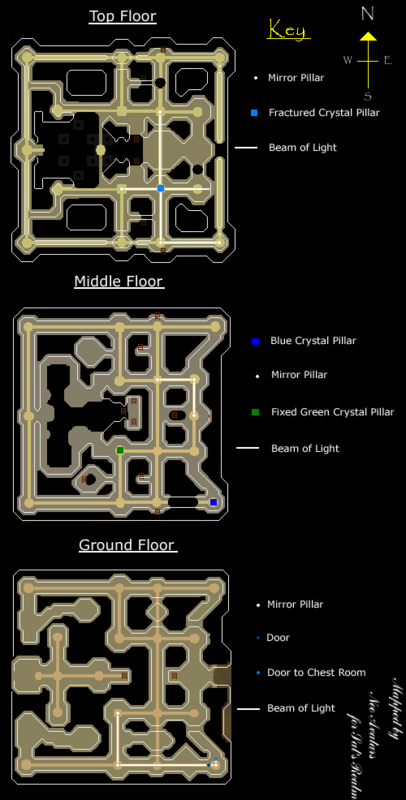 Return to the ground floor, and locate the pillar with green light coming from the top. Put a mirror in and direct the beam to the south. Head South and reflect the light to the East, making it possible to get through the door. Insert your final Mirror into the Pillar and make the light go North. Head through the yellow door and search the chest. Reset the puzzle and collect the Mirrors and Crystals. Place a Mirror in the Pillar beside the collector so it heads North. Head North a Pillar and make the light go down. The top should be to the South and the bottom to the North. Go down to the Ground Floor and head North a Pillar. Insert a Mirror and make the light go West. Follow the beam West 1 Pillar and insert the newest Fractured Crystal . The smooth side on this is to the East. If you have put in the wrong one then change it. Walk around the room that you can't get to that is just North of you and find where the light goes through another Pillar. Insert a Mirror into this so that the light heads up. Go back up to the Middle Floor and head to the Pillar next to the ladder in the North. Insert the Yellow Crystal into this and then head up the ladder. Insert a Mirror into the Pillar next to you and make the light go West. The beam will go through the Color changing Pillar and change color. Head to the North-West corner of the Top Floor again, inserting a Mirror into the Pillar to make the light head South. Follow the beam South 1 Pillar and insert another Mirror. Make the light head East to a fixed Pillar on the bridge across the middle which will make the light head down. Go back to the Pillar with the Fractured Crystal in and head South 1 Pillar. Insert the other Fractured Crystal into this . Insert Mirrors into the Pillars both East and West of this, making the light head upwards with both. Climb all the way up to the Top Floor and find the Pillar just South-West of the stairs in the center of the room. Put a Mirror into this Pillar and make the light head West. The light will hit into a fixed Mirror and go down to the Ground Floor. Go East 2 Pillars and insert a Mirror which should make the light head West. 1 Pillar West of here place another Mirror, making the light head North through several walls. Go across the stairs in the center of the floor and find the Pillar that the light goes through. Insert your final Mirror into this so the light heads West. 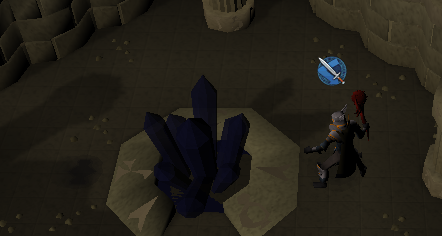 With your Blue Crystal, go West 1 Pillar and insert it. Go down the stairs in the middle of the floor, then go down again. You can now pass through the final door. Rotate the Mirror in front of the door so the light hits the four-way Mirror. Head through one of the three doors to the West and you will see a cut-scene and Thorgel the Dwarf will appear. He says that he will give you a Death Talisman if you get 50 items for him and will give you an Item List. On it is a list of 50 items. 47 of them everybody gets and the other 3 will be a Key, a Book and a Ticket. Read your list to see which your Key, Book and Ticket are then go back through the door you entered from. Note: You can get a Death/Omni Talisman, Tiara or Staff from another player so that you can enter the Death Altar. However, you won't be rewarded by Thorgel with a Death Talisman of your own. Rotate the Pillar that you rotated to give you access to the Altar so that you can climb back up the stairs. Don't forget to do this otherwise you will have to enter via a tunnel near where you talk to Klank and his friends during the Underground Pass Quest. If you do forget to change the Mirror then there are two ways to get back. You can either go all the way through the Underground Pass and walk to Klank and his friends or you can enter the tunnel in Isafdar and then when you cross the gaps in the bridges if you fall just run straight South and you will arrive at the correct place. Jug of Wine Made by putting Grapes into a Jug of Water (which are both easily obtained at the Cooking Guild) or bought from Karamja Tavern. Can also be stolen from the Wine Stall in Draynor Village. Dusty Key Either bought from the Legends Guild, or kill the Jailer in the Taverley Dungeon to get a cell key. Enter the Explorer's cell and speak to him to get the Dusty Key. Once you have collected the items take them back to Thorgel. You can take them in two runs, but if you have to go through the Underground Pass at all then you will have to take 3 runs over it. If this is the case you can take a Tiara to fuse the Talisman into if you wish. Remember to bring your "Newly Made Crystal" on your final run. Once you have given him all the items he will give you a Death Talisman and tell you that you can have as many as you like (these are tradeable). Once you have the Talisman, enter the Ruins and use your Crystal with the altar in the middle of the room. The Altar is full of level 19 Ghosts. If you have brought a Tiara with you then you can enchant it with the Talisman to make a Death Tiara. The Crystal will start to glow. Head back to the large crystal that you got your fragment from and use it with it. It will start to glow and the Protection Mechanism will restore. Make your way to Lletya and tell Arianwyn the good news. He will give you a Crystal Trinket. 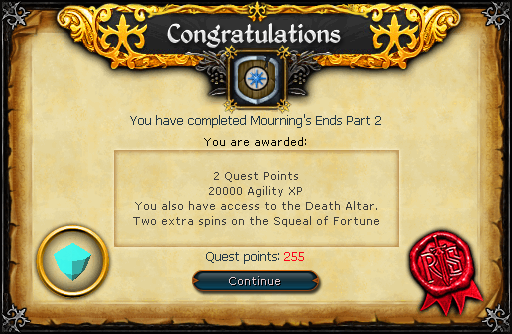 Well done, you have completed the quest. The Crystal Trinket gives access to the Temple after completion of the Quest. If you try to enter the Temple after completing the Quest without the Trinket in your inventory you will be bounced back and get this message in your chat box.